I really grieved when my son, Junior, was first diagnosed as being profoundly deaf. I cried, I moped, I thought about how the life I envisioned when I set out to have children was suddenly so much different than the life I now had. I thought about his future, the challenges he was going to face, the bullies he would have to ward off and the stares he would have to endure. What was worse than a few months of grieving, however, were the well-meaning people who made me feel guilty for grieving… made me feel like deafness just wasn’t “bad” enough to be upset about. One morning a few weeks after Junior was born and had already failed three hearing tests but hadn’t yet been diagnosed, I was struggling with my postpartum emotions. I went to my doctor and explained the added stresses I was facing on top of the normal hormones of a recent birth, hoping to hear some encouraging words, but do you know what she said to me? Yes, I knew things could have been worse. There were plenty of people in more difficult situations than us. But, that didn’t mean I wasn’t allowed to grieve. 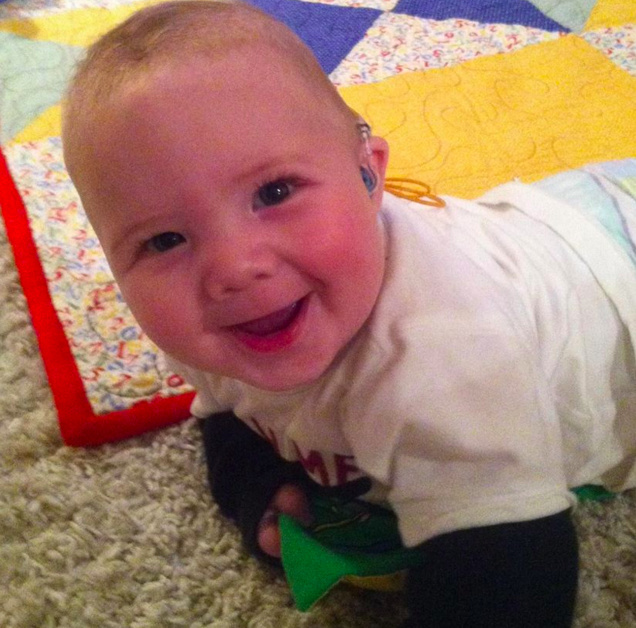 It didn’t mean that his deafness was “no big deal.” Especially when those comments came from people who had never been in the special needs world, had never experienced the pain of knowing their child was going to have added struggles in life. I had to grieve before I could move on. I had to accept the reality before I could become his loudest cheerleader, biggest supporter and strongest advocate. I had to go through all those emotions, because it was a big deal. It was my child, and I was scared of an unknown future. At just a few weeks old, we were making decisions for Junior that would affect him for the rest of his life. When I was supposed to be settling into the hectic, sleepless world of having a newborn and toddler, I was spending 20-plus hours a week at or traveling to doctors or therapy appointments. We were planning his life weeks, months and years down the road. It was a big deal. The comments that were said to make me feel better only served to make me feel worse. Not only because I felt guilty for grieving, but also because I realized that compassion and empathy is rarely found in those who have not traveled the special needs path. Looking back, the grieving process was a short but crucial part of our journey. Without it, I wouldn’t have forged lifelong bonds by reaching out to others who had walked this path, and I wouldn’t have realized that the valleys make the peaks that much more triumphant. I realized that no matter what they’re going through, our beautiful children are a big deal. Follow this journey on Save Money Live Joyfully. The Mighty is asking the following: What’s one thing people might not know about your experience with disability and/or disease, and what would you say to teach them? If you’d like to participate, please send a blog post to [email protected]ighty.com. Please include a photo for the piece, a photo of yourself and 1-2 sentence bio. Check out our Share Your Story page for more about our submission guidelines. Sara Elizabeth is the homeschooling mom of a 9-year-old daughter with dysgraphia and a 5-year-old son who is profoundly deaf, uses cochlear implants and also has severe sensory issues. She longs to give hope to families of children with special needs, encouraging them that no diagnosis or label can define their child. She bares her soul about the struggles and triumphs of special needs, homeschooling, faith, and frugal living at Save Money, Live Joyfully (www.savemoneylivejoyfully.com). She can be contacted at frugalmomma1(at)hotmail(dot)com.